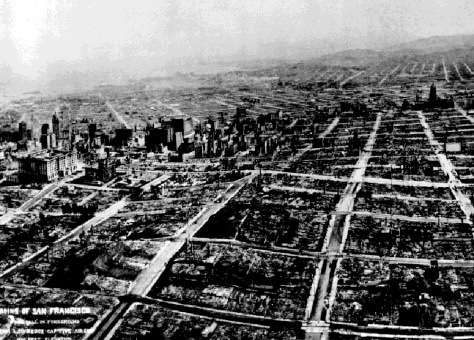 This photograph, taken from a tethered balloon five weeks after the great earthquake of April 18, 1906, shows the devastation brought on the city of San Francisco by the quake and subsequent fire. The view is looking over Nob Hill toward business district, South of the Slot, and the distant Mission. The Fairmont Hotel, far left, dwarfs the Call Building.